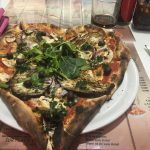 My Winter Adventure in France – Part 5 | C'est La Vie -This is Life! 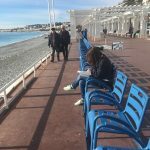 My journey continues on my trip to France last January of 2018 to Paris and the South of France. 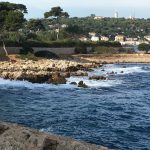 I am now in Antibes, between Cannes and Nice on my second week of being there. Enjoy the journey! Pampering day in Antibes. Took my first Uber to nail salon, all in pink, so knew Lord directed me there. 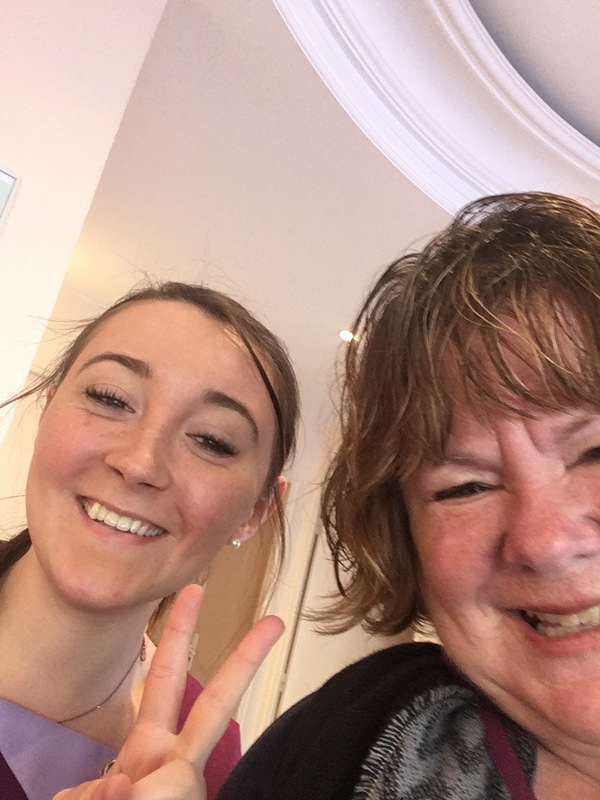 Cute girl Marielle did my mani pedi for 52 euros. Yikes. They don’t do color, that is extra. Very simple pedi done in a foot bath not big chairs. Wandered to main square to perfume shop and treated myself to a lemon toilette spray (86 euros on sale!). But I must smell good for Francois! Followed the way to la mer and the music of accordion. I sat admiring the view. “Lord, I could live here very happily. The sea and palm trees remind me of home”. 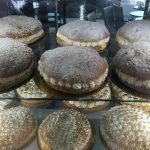 My stomach rumbling, I returned to my friend Vincenzi’s restaurant and was warmly greeted by all, he even introduced me to his uncle who kissed my hand! 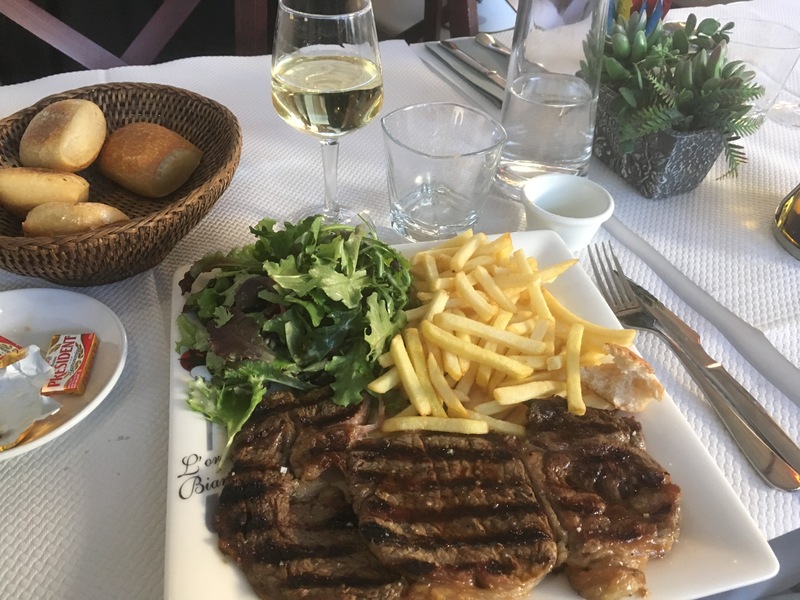 I ordered the special of steak, frites, salat, white wine and chocolate mouse, all for $15 euros, my deal for the day. Vincenzi threw a fit when I asked for leftovers to go. He is Italian. Need I say more?! Lord it is so decadent to drink wine in middle of day. But it is so French! 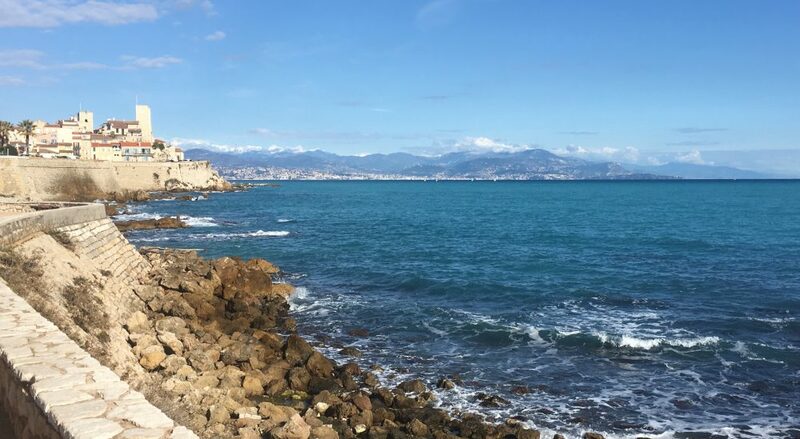 I have decided to stay the two weeks planned and concentrate on Antibes and Nice. It is just too much to travel to new cities like Cannes or Monaco and not know the layout. I want to take the train to Italy one day as it is so close. 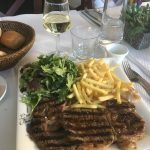 Bon appetite! What do you do when the Lord asks you to do something strange? Do you obey him? Today, I did. 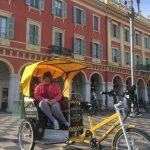 It was not the first time, but I took a leap of faith and told Vincenzi why I was here, to meet my husband Francois and come live in Antibes. He did not know of him, but took my card with name of hotel in case a man comes looking for le femme American, Miriam. He did not think it was crazy, as he is an talian AND Frenchman, and they believe in love in crazy ways. He kidded with me and said. “Are you asking me to come to your hotel tonight?” “Non, I am a good Christian woman.” We both laughed. He did the French trick of asking me if he smelt nice and I leaned in to smell his aftershave and he turned and kissed me on the lips! “Do the women fall for this every time?” “Oui.” He is not married nor wants to be, so I know he is not Francois. I hope Jesus is not jealous with his teasing! It feels good to have a friend and be known and welcomed at a place here. 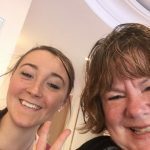 The girls at the front desk, Celine and Aurelia are so helpful and like me to check in with them every day to see if I got lost and hear about my adventures. They are even going to let me do a load of laundry here. God is good. I had a nice, relaxing day and slept into 11 am. Tomorrow is Nice. Aurelia has drawn me maps! 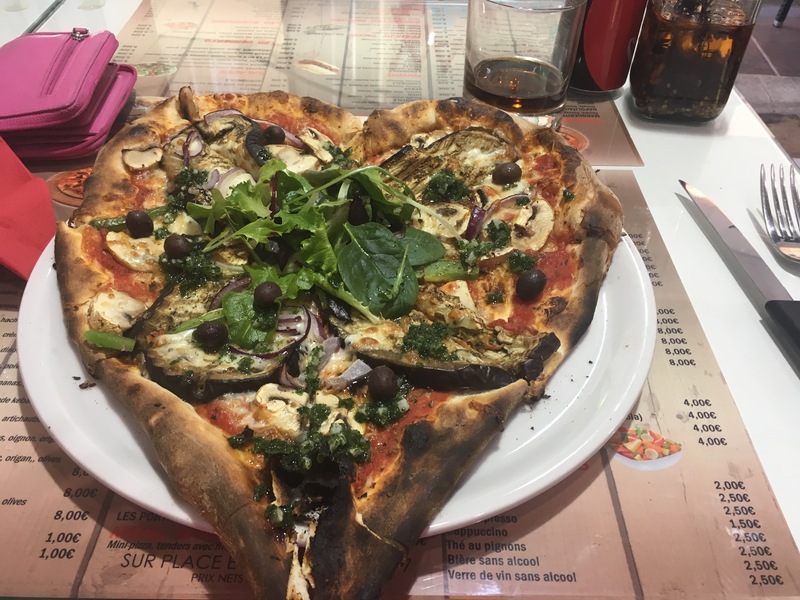 I just ate the best pizza in Old Town of Nice in a heart shape with eggplant, olives, mushrooms and arugula. I travelled by train, then took tram to Promenade du Anglese, the street that runs along le mer and where the tragedy of car ramming happened. The have cafes right on the beach and free blue chairs to sit in. The water is a baby blue with gray toned rocks pebbling the beach expanse. 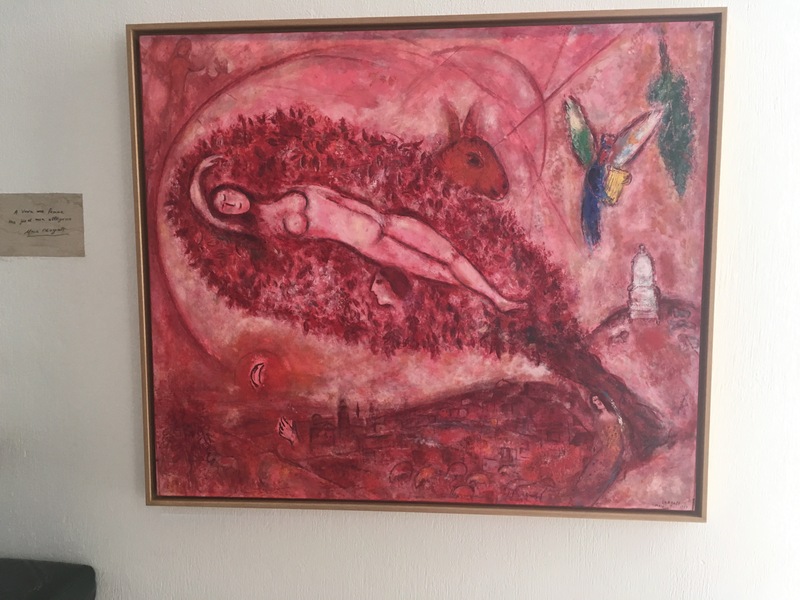 I am making my way to Marc Chagall Musee if I can find it! I walked arm in arm with Jesus along the promenade. I am so much more in love with him on this trip, he has taken such good care of me, which I know is from your prayers. Merci mon amis. 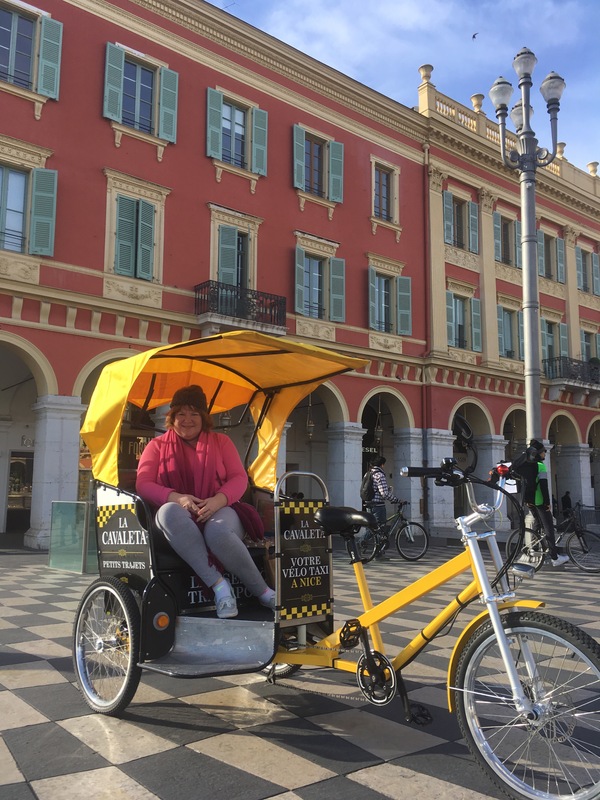 Part two of Nice: Took a ride in the bicycle with Armand, who didn’t know if he could make it up the hill to the Musee Chagall, but said he would try! Well, he did it, pulling fat me up the hills! I was overwhelmed with tears again to see my favorite Jewish artist, Marc Chagall’s works. He built the museum when he was in his early 80s to feel like a home, with olive trees and mediteranean plants. His canvases are so big, and such detail, I had to sit and find the biblical details and meanings in each one. 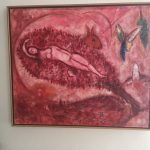 I especially loved his Song of Songs series in pinks and purples to express the love of King David and Basheba, whom the Jews believe the Songs were written about. He has Christ crucified in many painting, to supposedly represent the tortured Jew, but I think something else was going on in his heart. I couldn’t take it all in, so stopped, as I was very tired from walking all day on the promenade. I spoke with an artist displaying his art about the tragedy, and he feels someone in France was in on the terroism, as the security stopped bicycles from going into the crowds that day, but allowed the truck onto the road. Today, they have large white posts to block any car coming unto the promenade. Now a local, I picked up my baguette after I returned to Antibes by train, to have with my tapenade and cheese dinner. I love it here! Guess where I went for a matinee today? The French theater here in Antibes. A group of actors were staying at my hotel the last two days, and I met one in the elevator, John Baptiste, and so I thought I would go. While inquiring at the desk, a quiet, redheaded gentleman heard me and being the production head, he offered me a free ticket! His name is Francois, wasn’t he kind? It was exciting going, I met a nice Italian woman, Laura, who has lived here for 20 years, while having a coke before the show. It was titled Un Air du Famile about a normal, dysfunctional family that meets in a cafe every Friday night for dinner. I understood some of it, but ACT 2 was very funny, with crying and dancing and just universal themes that were expressed through drama. Isn’t the Lord good to let me see live theater here? He is full of surprises. Today was a simple, outdoor day taking the bus to Eden Roc Villa, famous hotel where F. Scott Fitgerald, Rita Hayworth and The Kennedy Family would stay. It is closed but I got a peek through the fence. 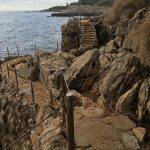 I then walked on the sentinel path along the Cap d’Antibes, stone steps along a narrow path falling to the sea. I sat and watched the waves crash on the stones, many looking volcanic in nature. Roc means rock in French. On the way back in town, I finally found a cheap, good salad for 4.9 euros, which I have been craving veggies. I am al breaded out! 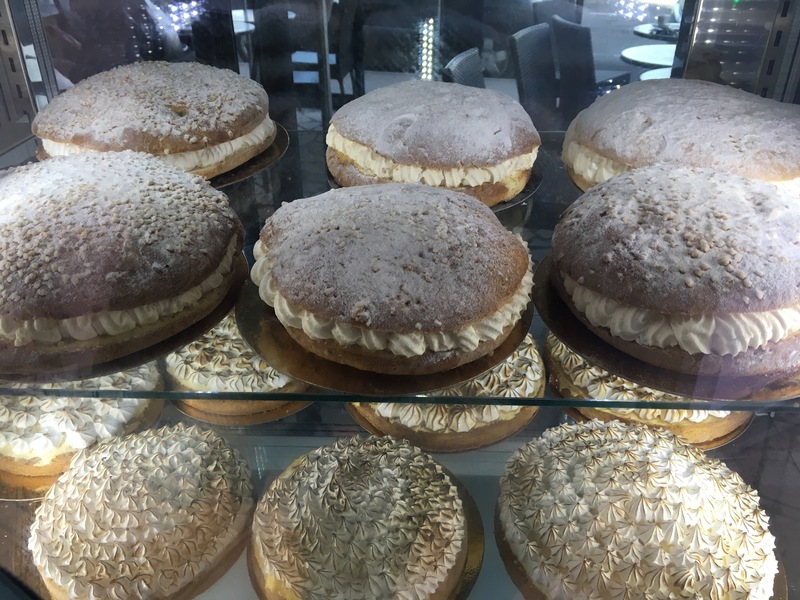 I discovered a famous pastry at a bakery, which Napolean ate and to which Marie Antoniette said, ‘Let them eat cake.” Here is a pic of them and the sea walk. Enjoy. 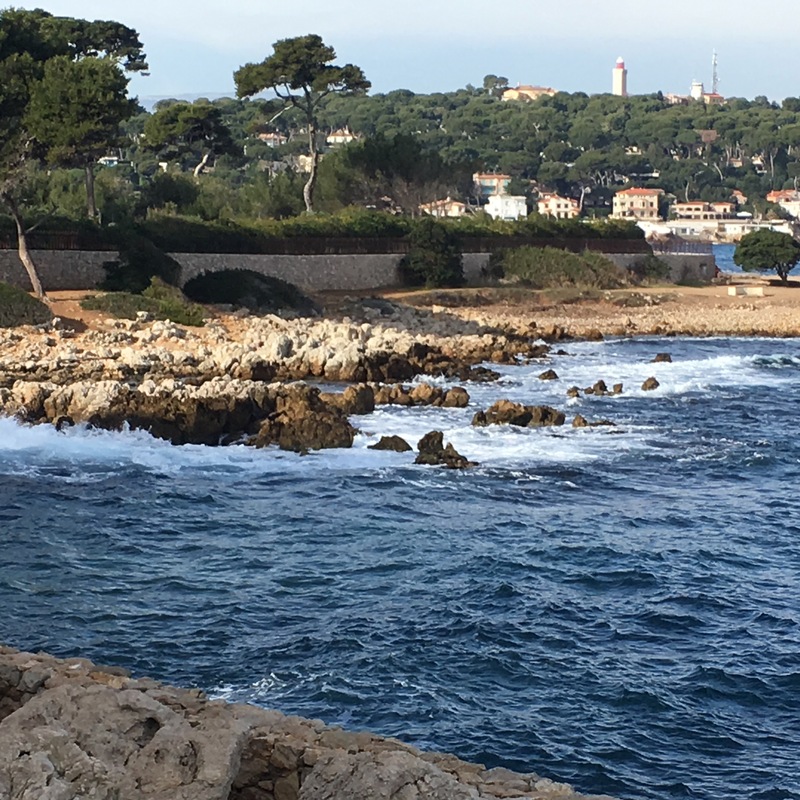 Check back in July for the final week in Antibes before heading home after my month long trip across the Atlantic on the Queen Mary and three weeks in France. This entry was posted in Christian faith by miriam. Bookmark the permalink.